SEALCONE W502 is a ready-to-use silicone resin based liquid, which is designed for rain proofing of porous materials like marble, granite, concrete and most kind of natural stone surface. SEALCONE is in colourless liquid form; it can penetrate into the substrate without changing the aspect of the surface. 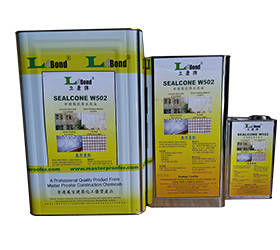 SEALCONE W502 is suitable to serve as water repellent protection for different kind of façade, wall and cladding in form of marble, granite, ceramic tile, bricks, cement based material etc. SEALCONE W502 can be covered by paints, it is micro-porous that it allows substrate to breathe. After application and completely cured, it becomes self-washing and able to prevent growth of mould.